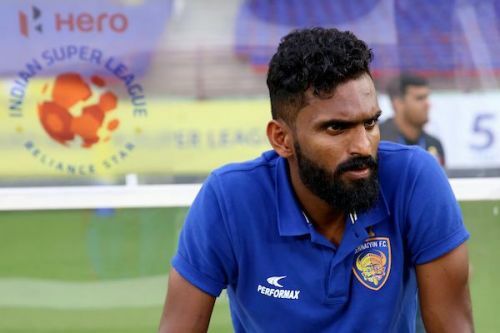 Former Kerala Blasters striker CK Vineeth has started an online campaign against cyberbullying, days after lodging a police complaint against Manjappada, the fan group of Blasters. Vineeth has often lamented about the treatment he receives from the Manjappada, saying they demotivate him through their constant attacks on social media whenever he fails to score a goal. Vineeth subsequently changed loyalties from Blasters to Chennaiyin FC in the winter transfer window and that seems to have further alienated the Manjappada. A week ago, on Feb 15, Chennaiyin paid a visit to Kerala Blasters and Vineeth was continuously jeered during the 3-0 defeat. Things turned sour a day after the match when Vineeth lodged a complaint against a few members of the Manjappada for a cyber attack wherein he accused them of spreading a fake story about the 30-year-old allegedly bullying a ball boy during the game. Vineeth says a voice note circulated in a few Whatsapp groups of the Manjappada accuse him of being unfair to the child even as he denies the incident. And now, Vineeth has kick-started a campaign against cyberbullying with the tagline - abusing is not criticising. His former Kerala teammates Sandesh Jhingan and Anas Edathodika tweeted in support of the initiative. Even former Kerala Blasters star Iain Hume, now with FC Pune City, posted a photo on Instagram against cyberbullying. It appears that Vineeth feels the Manjappada's way of criticising players is not right and amounts to abuse. In an interview with Asianet News, Vineeth said: “They (Manjappada) are the number one fans based on numbers. When you think of them as supporters, I don’t think they are number one." Back in November, Vineeth had said the fans are abusive and blame him for Kerala's poor outings. Vineeth, since joining Chennaiyin FC, has scored one goal in 4 matches. Chennaiyin are bottom of the table after collecting just 8 points in 16 matches. The defending champions are no longer in the contention for a spot in the playoffs but will feature in an AFC Cup playoff against the winner of the two-legged tie between Colombo FC and Transport United. In all probability, that game will be against Colombo, who clinched a 7-1 win in the first leg against Transport. Chennaiyin's two-legged playoff tie will be held on March 6 and 13 with the latter being the home fixture. If Chennaiyin progress, they will make Group E and fight with Abahani Dhaka (Bangladesh), Manang Marshyangdi Club (Nepal) and I-League club Minerva Punjab for a spot in the knockouts.